Wojapi is a traditional Native American dish that has been enjoyed for centuries. We give you fair warning that once you’ve had your first taste of wojapi, you won’t be able to put down the spoon. Wojapi has been made by Native American tribes for centuries, with each generation passing the recipe down through the family. 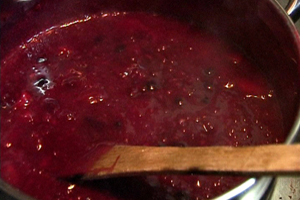 It is created with a combination of wild berries that can be found growing on the Great Plains, corn flour and honey. One of the favored berries for the recipe is the chokecherry. Used extensively by the North American Native tribes, the chokeberries were ground up, including the stones, and used in soups, stews, pemmican and even with salmon or salmon eggs. (Speaking of pemmican, check out our blog post and recipe for this ancient dried meat jerky.) The bark and even the roots of the chokecherry trees were used in medicines to treat a host of illnesses. The bark was boiled along with other ingredients to produce a remedy for diarrhoea. A strong, black, astringent tea was made from boiled twigs and used to relieve fevers. Dried roots were chewed and placed on wounds to stop bleeding. Teas were made from the bark or roots and used to treat coughing, malaria, stomachaches, tuberculosis and intestinal worms. Such teas were also used as sedatives and appetite stimulants. The fruit were used to treat canker sores, ulcers and abscesses. Of course, wojapi was not made only with chokecherries, but included any wild berry. Today, a modern version is made using frozen blueberries, raspberries and cherries. We’ve decided to feature the original recipe, made with wild berries of the Great Plains, but you can replace the hard-to-find berries with any combination of fresh berries from your local grocer. Of course, if you want to be truly authentic, you could order some chokecherry seeds online, plant the seeds and wait for the trees to mature, harvest the fruit and make your own homegrown chokecherry wojapi. We think it might be worth the wait. Berries (Wild Choke Cherry, plum, sand cherry, currant, buffalo berry, or grape. All wild, all found on the Great Plains.) *Substitute any combination of available fresh berries. Mash fruit, boil pulp for about one hour at low heat, strain through a cheese cloth type cloth. (This first cut is used for fine jelly). Boil again for an hour, remove seeds and half the pulp, add a white sauce of water and flour to boiling fruit and water. Thicken and add honey to taste. (This second cut is wojapi). Serve with ice cream or frye bread. * You can substitute corn starch for wild corn flour. Foods Indigenous to the Western Hemisphere. This entry was posted in Blog, Bon Appetit Wednesday, Culinary, Culture, Healing Arts, Public Life, Religion, Science and Technology and tagged ancient cuisine, ancient history, ancient recipes, AntiquityNOW, chokecherry, Native American food, Native American recipes, pemmican, Recipes with a Past, wojapi. Bookmark the permalink.